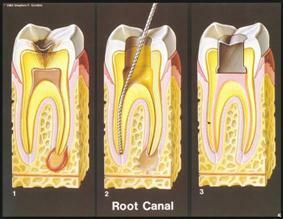 Root canal therapy is the treatment of choice to save a tooth that otherwise would die and have to be removed. Many patients believe that removing a tooth that has problems is the solution, but what is not realized is that extracting (pulling) a tooth will ultimately be more costly and cause significant problems for adjacent teeth. Sometimes no symptoms are present, although X-Ray indicates decay or infection. Decay has reached the tooth nerve. A root canal procedure requires one or more appointments and can be performed by a general family dentist or an endodontist (root canal specialist). While the tooth is numb it is isolated to keep it dry and free of saliva. An opening is made on top of the tooth and small files are used to remove the decayed nerve tissue and bacteria. If tooth decay is present, it will also be removed. At the next appointment, usually a week later, the roots and the inside cavity of the tooth are filled and sealed. A filling is then placed to cover the opening on top of the tooth. Teeth that have root canal treatment should have a cap (crown) placed to protect the tooth, prevent it from breaking, and restore it to its full function. After treatment your tooth may still be sensitive, however, this will subside as the inflammation diminishes and the tooth has healed.